We’ve been intrigued by Farro recently. It has started appearing in some of the more upscale restaurants around town — reminding me of Polenta’s sudden promotion to a “fancy” entree about a decade ago, even though it has long been a staple food for the poor in Europe. There seems to be a bit of confusion on what, exactly, this ancient grain might be. Depending on who you ask, it could be Emmer, Spelt, or Einkorn — which are all closely related.
) and they worked nicely. The cooked grains are high in fiber and protein, and have a mild, nutty flavor. They’re chewy, not mushy. The big caveat on this otherwise easy dish is that it takes about 90 minutes to cook the grains — so be sure to plan ahead and leave ample time for them to cook thoroughly. Oh, and the last twenty minutes are a little hectic, as you need to manage several burners at once. This is a good dish to make with a friend. Rather than frying or baking the tofu (which would toughen it), we decided to simmer it in vegetable stock. The result was smooth, soft tofu slices, which made a perfect contrast to the chewy Farro grains. Simmer the tofu in vegetable stock. The result was smooth, soft tofu slices, which made a perfect contrast to the chewy Farro grains. Add the farro and 3 1/2 cups of the broth to a medium saucepan, and simmer for about 90 minutes. Once the grains are cooked to the desired texture, drain any excess broth. When there are about 15 minutes left, steam the broccoli, cabbage, and carrots (and any other veggies you want) in a small saucepan. At the same time, bring the remaining 2 cups of broth to a boil in a saute pan or skillet. Slice the tofu into 1/2” strips, and simmer gently in the broth, for about 10 minutes. One more thing while you’ve got all this going on: Toast the sesame seeds until they’re lightly browned. Mix the cooked vegetables into the farro. Salt and pepper to taste. 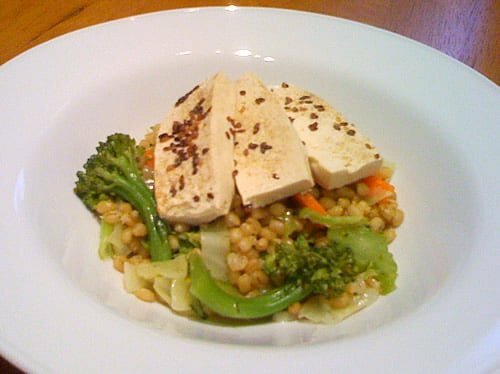 To serve, place the farro and vegetables in a bowl and gently lay the tofu on top using a slotted spoon. Sprinkle the tofu with the sesame seeds and serve. [Poll] Restaurant Letter Grades: Good or Bad?